Many infrastructure facilities, including roads are overloaded as many new residential areas have been built and the number of means of transportation rapidly rise in suburban areas of HCM City in the past few years. It takes longer time for residents from these residential areas to travel in these suburban districts. Le Thanh Tu, a 34-year-old resident from HCM City’s District 7, said it takes him from 45 to 60 minutes to travel the 6km road from his home to his office in District 5. Tu said the two bridges of Nguyen Van Cu and Kêeh Te connecting his home to his office in District 5 are overloaded and he has to depart from his home at 6 a.m every morning because he would not like to be trapped in traffic jams on the roads for 30 minutes. “We were haunted with travelling on these roads every day,” said Tu. According to a report on Người Lao Động (Labourer) newspaper, on the morning of April 5, hundreds of cars and motorcyles were jammed on the Nguyen Huu Tho Street in District 7, struggling to reach Kenh Te Bridge. Residents from other districts also face traffic jams. It takes residents from the suburban district of Hoc Mon, which is 19km apart from the centre of District 1, from 60 minutes to 70 minutes to travel from their homes to offices (in District 1), because the two major roads in the district – Truong Chinh and Quang Trung streets – are encountering frequent traffic jams. The increasing number of labourers from Districts 2, 9 and Thu Duc seeking jobs in the inner districts of HCM City every day has added fuel to the fire, causing frequent traffic jams on Ha Noi Highway, Mai Chi Tho Boulevard, Thu Thiem Bridge and Thu Thiem Underground Tunnel. 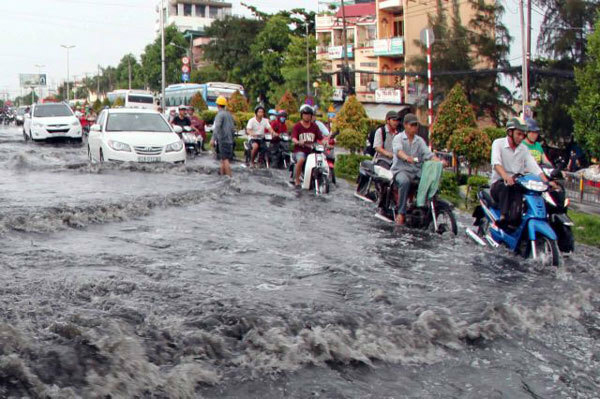 According to reports from Binh Chanh District People’s Committee, the district has faced under-developed infrastructure development. The rising number of migrants re-settling in Hoc Mon every year has increased the number of means of transportation in the district. However, inadequate investment in infrastructure development has caused environmental problems such as traffic jams, flooding, and air pollution.